Pocket springs are the foundation of high-quality mattresses and are a fundamental component that any mattress buyer should fully understand. The key thing to remember in this section is that pocket springs, types and counts should not be taken in isolation. Read on for all you need to know about pocket springs and why assessing their quality is essential to helping you find the right mattress. What is a pocket spring? Tailored Spring Gauges – Soft, Medium or Firm? How are pocket springs made? What is a Vanadium spring? A pocket spring is a case, usually made of fabric that encases a wire spring. These cases are either stitched or in cheaper models, glued together to create a length of individual springs that are connected. This enables a sleeper to be supported independently by each pocket spring. It’s great to prevent movement between sleepers and will enable you to have far greater support than a cage sprung or open coil mattress. The highest quality pocket springs will be calico encased and the spring wire will be vanadium plated. This enables them springs to breathe and prevents heat build up. 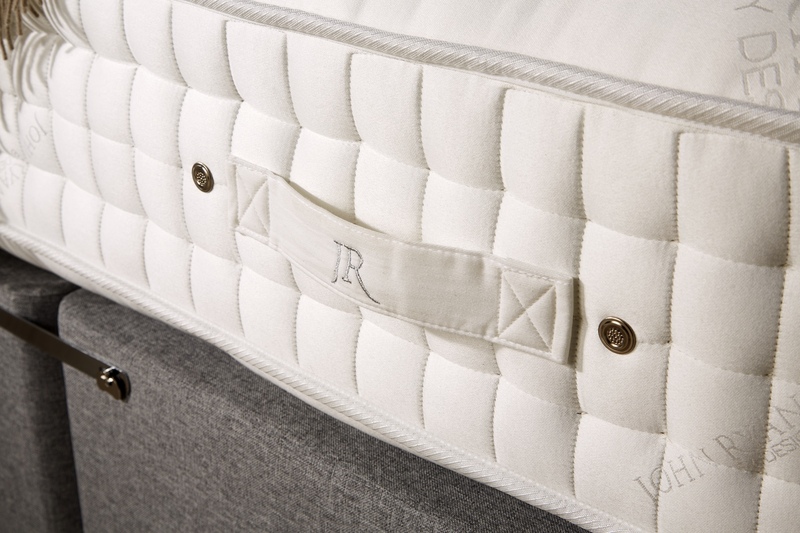 Our Mattress collection only uses Pocket springs, if you want to see more please visit our shop to start browsing. We have always advocated for high-quality handmade pocket sprung mattresses over mass-produced bags of springs such as open coil mattresses, but there’s still a minefield of information on pocket springs which we aim to summarise for you. We like to keep things simple so we have summarised to two types of pocket springs below. 1.Synthetic spun bond springs – the entry-level spring unit. Glued together with a polyester style material. The least breathable and responsive. 2.Calico encased pocket springs – Encased in a breathable natural calico cover which are then stitched together. Highly responsive and much more breathable. Calico pocket springs are quite simply the highest quality spring you can get in a mattress. All the high-end manufacturers, such as Savoir beds, Vi-spring will use calico pocket springs in their top end ranges. Each spring is housed in a calico cover, this provides more flexibility than the synthetic spun bond counterparts meaning the springs can flex easily and breath more than cheaper pocket sprung units. The calico pocket springs are sewn together and are only attached to adjacent springs with lengths of twine stringing them together. This is always done by hand by a skilled craftsman. For instance, there is no use having a super duper all singing all dancing pocket spring unit when it is not backed up by an element of substantial upholstery. 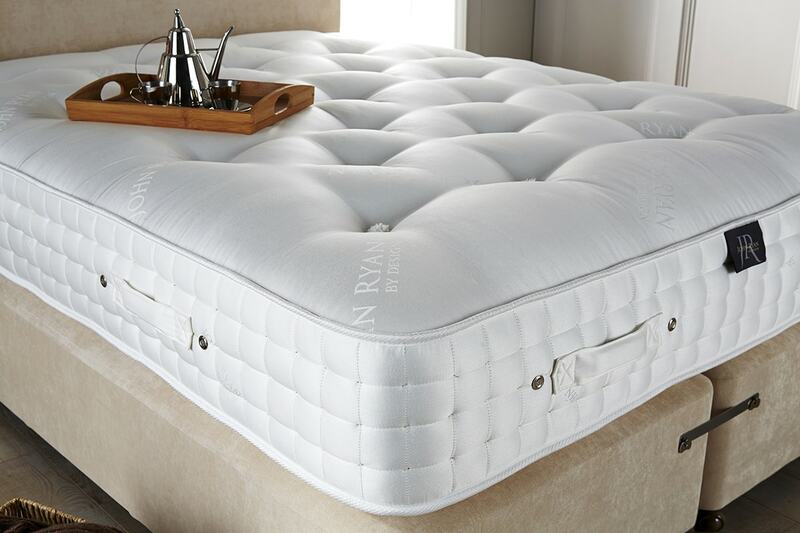 As you browse through the internet looking for your perfect mattress you will soon see that in most cases great swathes of text is focused on how good the pocket springs are in any particular model, the science behind the design and how you will sleep like a baby. All of this will be relatively pointless if equal space is not designated to the rest of the mattress, the upholstery, the detailing and so forth. The fact of the matter is, a standard pocket sprung unit which forms the basis of many mattresses, will be suitable for practically everyone. Especially when compared to a cage sprung or open coil mattresses which should be avoided at all costs. Standard spun bond pocket springs are not overly expensive and will offer you all the support you will require. Pocket spring counts are always based on the number of springs in a king size mattress: 150 x 200 / 5’0 x 6’6. Even when a single mattress is described as having 1000 pocket springs, for example, it won’t. It will have proportionately less. A super king size mattress will have proportionately more. Some retailers have started to give the exact count of a particular size which throws a fly into the ointment when you are doing like for like comparisons. Always be aware of the count in a king sized mattress and you just can’t go wrong. The least number of pocket springs you can get in a mattress is 600. This level of spring count will be in starter or budget ranges of pocket sprung mattresses. This is a good example of the value of a pocket sprung unit, obviously, the retail price will be low but, the quality level of mattress will be significantly better than any mattress utilising an open coil or continuous coil retailing for a similar price. The most pocket spring units you can get into a king-sized mattress on one layer is 2000. Mattresses described as having more than this are utilising double layer construction techniques or they are utilising a suspension pocket sprung unit or they are using mini springs to increase the count. When looking at descriptions and you see a specification with more than 2000 pocket springs you really do have to examine how this was achieved. As I have said in previous posts, the only differentiating factor between many mattress manufacturers are the springs used. Fundamentally, the springs will more often than not be similar but how they are constructed will provide enough difference to achieve the elusive brownie points that will sway you into thinking their product is somehow better than the competition. Guide to pocket springs: A good thing to bear in mind that a 1000 / 1500 / 2000 pocket sprung unit will be broadly similar from about 90% of all manufacturers. It is what is placed on top of the units (upholstery) that makes the difference in Price and in quality. Total spring counts come in usually at 600 / 800 / 1000 / 1200 / 1400 / 1500 / 2000 pockets per unit. Which is best a Pocket Spring or Open Coil? If you are torn between two similar mattresses one open coil and one pocket sprung the pocket sprung mattress will win hands down! Like I said above, the minimum 600 pocket count is far superior to any open coil or continuous coil mattress you can get. 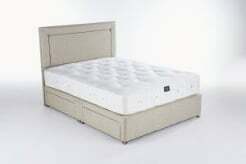 It is so unlikely an open coil/continuous coil mattress will have a quality level of upholstery attached and all these fall within the low-end range of mattresses. How many springs do I need? 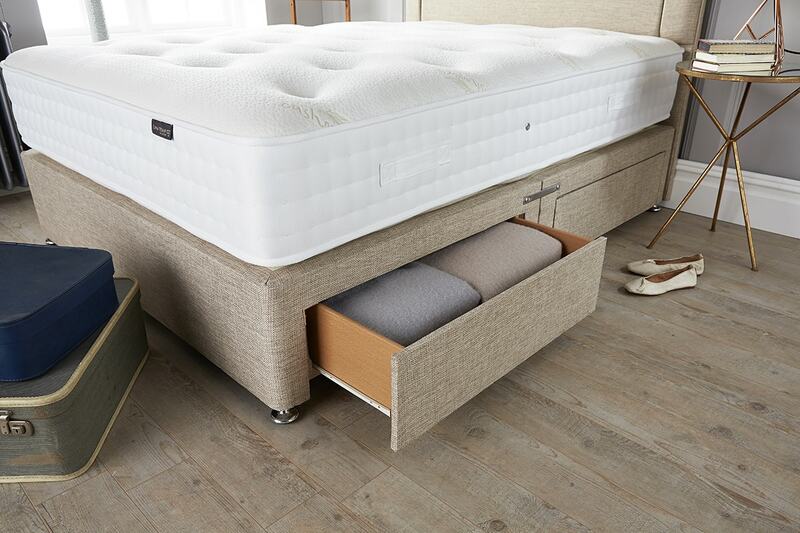 If you look at the complete range from Rest Assured, for example, you will see that the bulk of their mattresses utilise a 1400 pocket spring unit. This count will suit the majority of users not too firm and not too soft. A bigger person (such as my 20st Rugby Player friend) will gain more benefit from a 2000 unit. His weight will be equalised over a greater number of springs, The springs will not be fully compressed but allowed to ‘move’ with him. If he was on a 1000 pocket unit, for example, the weight is distributed over a lesser number of springs. Whereas our ten stone friend will be quite happy on 1000 pockets. This is only half the story, though! The other difference between 1000 springs and 2000 springs is the tension of the spring itself. There is no hard or fast rule on what gauge wire is used on a particular spring count: A 2000 unit can utilise a firm spring say 1.5mm or it can utilise a soft spring say 1.2mm. And it is this reason alone why the question above cannot be answered with any degree of precision. It is so unlikely a retailer will know what gauge wire is used on any particular unit contained in a particular mattress. Generally, though and this certainly does not apply in all cases manufacturers tend to go down the soft / medium/ firm route and use the firmer springs on the 1000 counts to softer springs on the 2000 counts. The theory being that 2000 pocket springs do not have to be as supportive as 1000. The support will be there but spread out over a greater number of springs. I know you are thinking now that if a 1000 spring unit is firm why would that suit our ten stone friend? Good point. The Firm spring unit only has 1000 springs and at a gauge of say 1.5mm. The 2000 spring unit at Soft will have a gauge of 1.2. This difference in spring gauge is fractional and nominal between two individual pockets. They will both compress easily under the pressure of your hands. As the number of springs increases as in a complete unit, it takes more pressure to compress them. Once you move away from cheaper mass produced springs you then have the option of tailored spring gauges. This means that dependant on your weight you can choose a soft, medium or firm spring. This means that you have the potential for split tension mattresses and zip and links. So if you and your partner are different weights, then you can have different tensions to suit each of you. Creating the perfect sleeping experience for both of you! Our Handmade mattress range are all available in both zip and link and split tensions if required. Spring wire diameter is sometimes shown on product descriptions, not to be confused with spring gauges. It shows you how thick the wire is for that spring unit. The thicker the spring wire the firmer the support you will get from it as it’s harder to compress. The gauge refers to the torsion, push-pull measurement which tells you how resilient/firm a mattress spring is. An example of this is an orthopaedic mattress which has a gauge of 12 and is very firm. We have a handy table that allows you to see the spring wire diameter we use in our range and the tension that the spring is set at. We also, unlike many competitors, allow you to see what the weight tolerance is for these springs. This is crucial when working out the support you need and we detail this more in the article on soft, medium & firm. In the bulk of all mattresses, you will come up against the pocket sprung unit itself, which will be relatively similar. They are produced in this country in large factories such as Leggett and Platt, Charles Blythe and such like. There are also imports with the most regarded being Agro gmbh (Germany). Currently, the most prolific imports of pocket sprung units come from Turkey and South Africa. Some manufacturers have the equipment and facility to produce their own springs such as Vi-Spring/Harrisons and, of course, the manufacturer we use who makes our Artisan range all completely made in Britain. Each one of our Artisan Calico Encased Pocket Springs is made by a specialist piece of machinery. 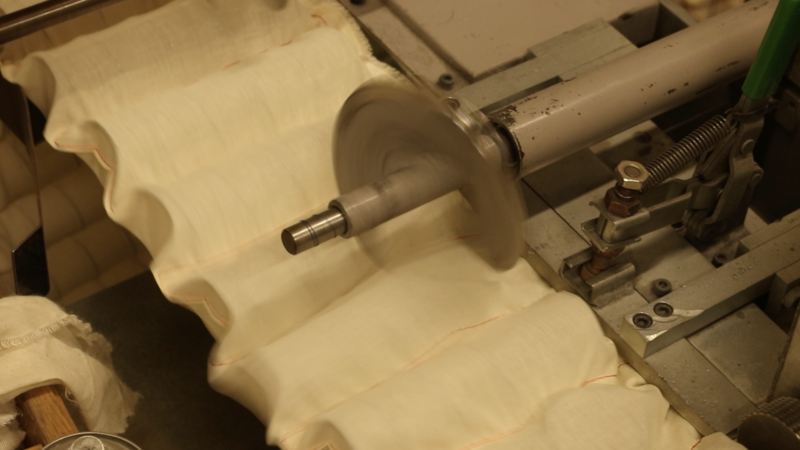 Each individual spring is formed and then inserted into a calico sleeve which is then machine stitched shut. Once each length of pocket springs have been formed they are then hand cut so each strip is one piece. Cheaper synthetic pocket springs maybe glued together instead of stitching to reduce the time required to make them. What’s a Vanadium pocket spring? Vanadium is used in the steel forging process and provides strength to the metal which assists when it is then formed into a spring. It also has a low oxidisation value meaning it doesn’t corrode as quickly as other metals. So springs dont rust. We use Vanadium on our calico pocket springs that are found in the higher end Artisan models. Vanadium is often found in metal alloys and top end tools to give strength and durability against corrosion. It is used within our springs to ensure they are of the highest quality giving an enhanced lifespan and longevity. Most manufacturers couldn’t tell you what is in their spring wire, you will probably just get shrugged shoulders, but here at John Ryan, we can share with you the exact composition of our calico vanadium pocket springs. If you’re wanting the best of the best you need to be looking for calico pocket springs. If your budget constrains you, a spun bond pocket spring unit with at least 1000 pocket springs per kingsize will get you a mid-range mattress. There is also a post on this site about the anomalies of soft medium or firm mattresses. Worth a read particularly if you are struggling with how on earth a mattress can be described as such. 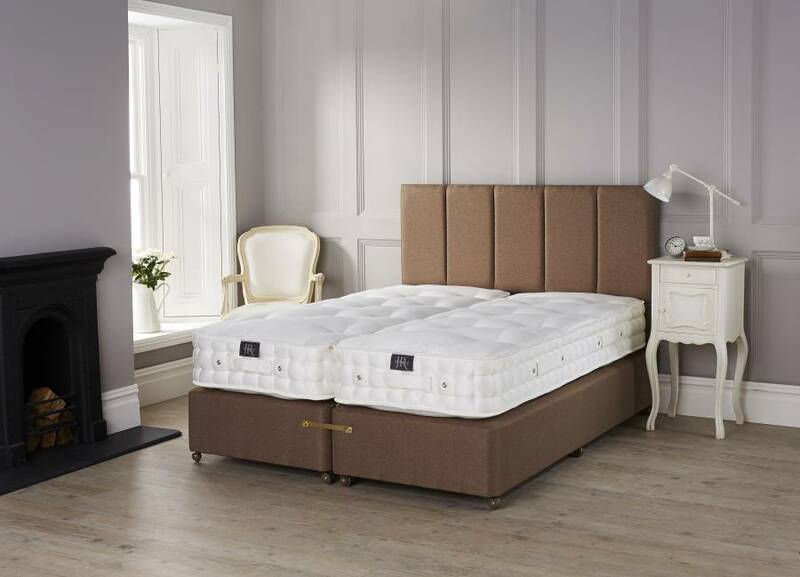 If you have different body weights we can create split tension mattress or zip and link beds which can be tailored specifically to your weight. Lastly, if you want to get really informed on the details of pocket springs and the different tiers, gauges and latest developments read our detailed arguments here. To help start off by viewing some of the best handmade mattresses here in our shop where we only use the highest quality pocket springs and coverings. Still struggling? Then why not call our small expert team based here in Manchester on 0161 437 4419 to see if we can help?